Ah, comfort food... the woobie of the culinary world. Everyone has their own special dish that just feels right when you don't. Be it a rough week, a rainy day, an illness or a heartache, comfort food is the warm hug when Mom can't be there. 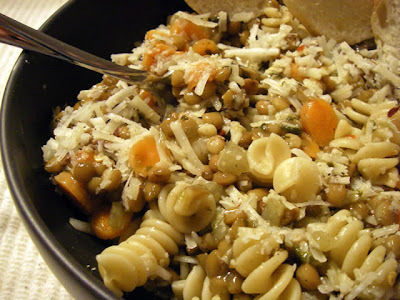 Comfort food is easy to prepare, usually contains only a few ingredients, and is relatively inexpensive. I consider our comfort food ingredients to be staples in our kitchen, and at any time, I'm sure I could produce at least four different comforting dishes. We have a number of dishes that fit the bill, and we'll be sharing them, well, when we need them ourselves (easier on the digital camera and pantry that way). The first one up is one of those concoctions that have morphed from the original way that Regina's family prepared it. And it couldn't be a simpler meal. * The Barilla Plus is a fantastic product for dishes with heavy sauces. It's a sturdy, yet tasty pasta, and dog-gone-it, it's better for you than regular pasta. Rotini holds the sauce best, but we have been know to use whatever pasta is on hand. 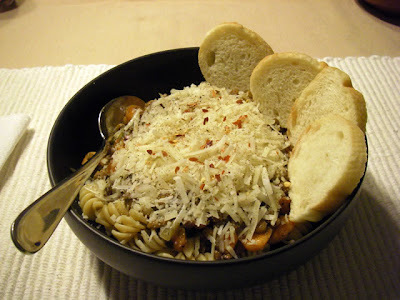 ** Okay, I got a little fancy here and picked up a shredded parmesan/romano blend. nice. 1. 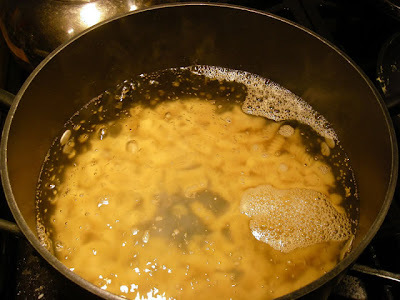 Cook the pasta to 'al dente' (follow the box time) in one gallon of boiling water, with one tablespoon of kosher salt. 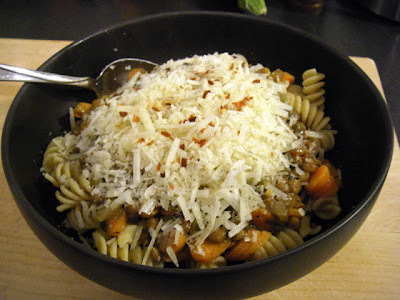 Try not to overcook the pasta, as it is going to absorb a fair amount of moisture from the sauce. 2. 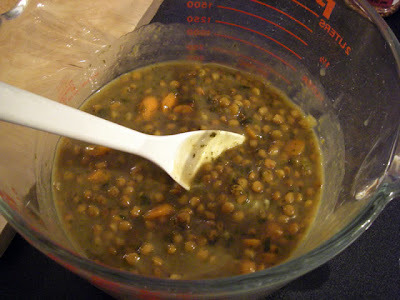 While the pasta is cooking, and this is the tough part, empty the can of soup into a microwave-safe bowl. 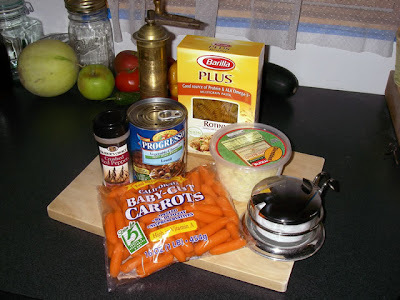 Add the sliced carrots, cover and nuke on high for four (4) minutes. If your microwave-safe bowl does not have a well-fitting lid, just cover it tightly with plastic wrap, but be sure to poke a few holes in it to allow steam to escape (Note: If you "need" comfort food, I don't think you'll be wanting to clean out your microwave oven). 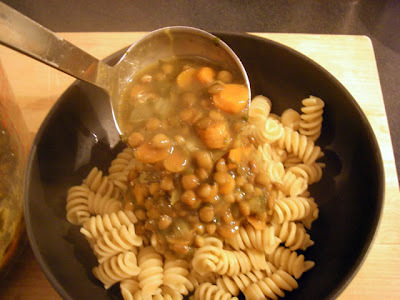 If you don't have a microwave oven, just heat up the soup in a medium saucepan on the stove. 3. When the pasta is done, drain the pasta and move to bowls. Ladle the heated soup over the pasta. Wipe drool off camera. 4. Add the parmesan.. a LOT of parmesan... as we say 'round these parts, "Let it snow!" Add fresh ground pepper and red pepper flakes to taste. 5. Enjoy! Now wasn't that easy? Serving suggestion: Bowl and spoon make it much easier to eat when curled up on the couch. Add a little bread. I picked up some of Boomper's favorite "round breads" on the way home from work. As far as beverage pairings with this dish, I say "comfort with comfort". This dish was wonderful with an Ithaca Beer Co. Nut Brown Ale. For other beer pairings, I'll defer to our resident brewmaster, BobbyC. What's YOUR idea of comfort food? We'd like to hear from you.